I’m currently searching for a new foundation, as my skin is in bad shape at the minute and I can’t think of anything other than my makeup that has made it this way. Recently I received a few foundation samples and thought I’d try them out individually and do a little product review of them! I’ve received four samples; Garnier’s “BB cream”, which offers “beyond flawless skin”, Lancome’s “Tient Miracle” which is a bare skin foundation with SPF15, L’Oréal’s “Infaillable 24h matte” and finally Sisley Paris’s “Phyto Teint Éclat.” They’re all French samples so the names are in French, but a quick google will find you the British equivalents. Every day I’ve used a base of Biotherm’s Skin Best Serum, which I’m also trialling at the moment. It’s a youth protecting serum and makes you skin feel like heaven. It has a pretty similar texture and feel as a primer base, so I’m hoping that just using this and skipping the primer won’t make much of a difference. It’s readily available in Sephora in France but is a tad expensive, at 50 euros for a 30ml pot. However, you don’t need to use a lot and the results are amazing. So, I think I’m going to be going out and buying the full sized Lancôme foundation as soon as I get paid at the end of the month! 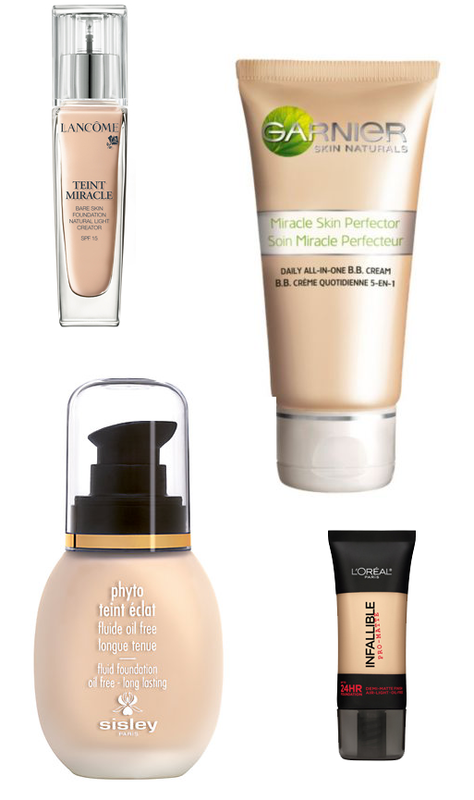 Which foundations do you swear by??? Previous Post List: What I’m …ing this week! Next Post Wishlist: let’s go to the beach-each!